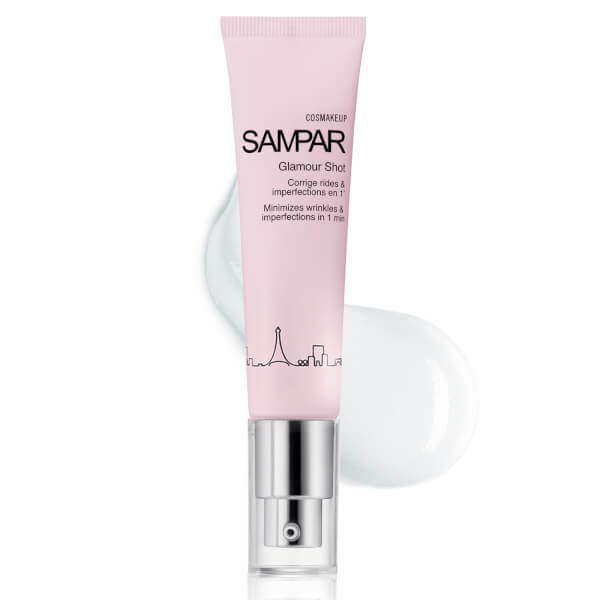 Discover the first transparent foundation with the SAMPAR Glamour Shot Foundation; an innovative, universal formula that is designed to replace liquid foundation. The anti-ageing formula is technically a skincare product that is able to offer similar results to makeup as well as its expected skincare benefits. Formulated with HQA Microlens and Hyaluronic Acid, the clear foundation glides onto the visage, delivering an invisible, soft focus finish. This reduces the appearance of enlarged pores, redness and fine lines and wrinkles, whilst Oat extract visibly lifts skin with immediate effect. The unique formula also boasts an Urban Advance Complex, which blends Shea Butter serum, Mint Endorphin and Probiotic Sugar together to act as an antioxidant shield. 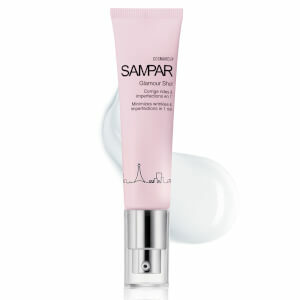 This protects skin from environmental aggressors, as well as strengthening the complexion’s natural defences. Expect a smooth, matte complexion that is unified and radiant. Moisturizs your skin with the adapted product. Then apply a small amount of Glamour Shot and evenly distribute while smoothing, starting from the inside to the facial contours. You can wear Glamour Shot alone, or apply powder foundation on top. Treat yourself to Glamour Shot at any time of day, even over make-up, for a quick pick-me-up. Please note that it is not compatible with liquid foundation. Aqua (Water), Polydiethyleneglycol, Adipate/Pdi Copolymer, Cyclomethicone, Beta Vulgaris (Beet) Root Extract, Dimethicone, Glycerin, Vp/Va Copolymer, Hydrolyzed Corn Starch, Sucrose Palmitate, Polyacrylamide, Hydroxypropylmethylcellulose, Amodimethicone, Avena Sativa (Oat) Kernel Extract, Phenoxyethanol, Caprylyl Glycol, C13-14 Isoparaffin, Chlorphenesin, Tocopheryl Acetate, Glyceryl Linoleate, Phenyl Trimethicone, Polyethylene, Laureth-7, Butylene Glycol, Lactilol, Xylitol, Benzyl Alcohol, Sodium Hyaluronate, Pentylene Glycol, Mentha Piperita (Peppermint) Extract, Ethylhexylglycerin, Methylisothiazolinone, Butyrospermum Parkii (Shea Butter) Seedcake Extract, Potassium Sorbate, Citric Acid.